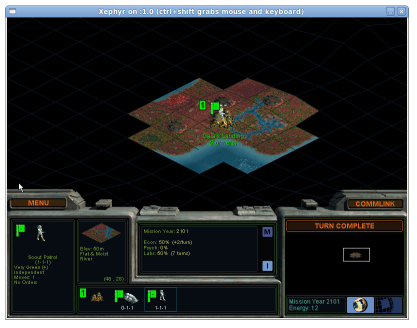 The computer strategy game Alpha Centauri (SMAC) keeps getting older and is not maintained since the company having the rights — Loki software — closed its doors, and the source code to the program is not by any means available to the public. It crashes easily for many reasons, but mostly for incompatibilities with the recent sound and graphic architectures. This is a game that I still enjoy from time to time when I feel very lazy. I get discouraged easily when the program crashes, leaving the screen resolution in a different setting, a few times in a row. A large number of recent Linux installations have graphic features activated from an extension called Composite. This extension allows to create visual effects that are used in software such as Compiz and Beryl. However, SMAC is completely incompatible with the Composite extension, resulting in a crash shortly after the game starts (when the capsule lands, and the first base is founded). The usual workaround is to disable the Composite extension by adding a configuration option for the Xorg server, but doing this will prevent visual effects to work. Note that we can disable the Composite extension for this X server only. To launch SMAC, I have to specify the display to use. In the current example, Xephyr will create an X server as display :1. You should now see SMAC running in the Xephyr window.